Engineering students Ryan Shea and Sarah Tevis test out the Ford car seat prototype. 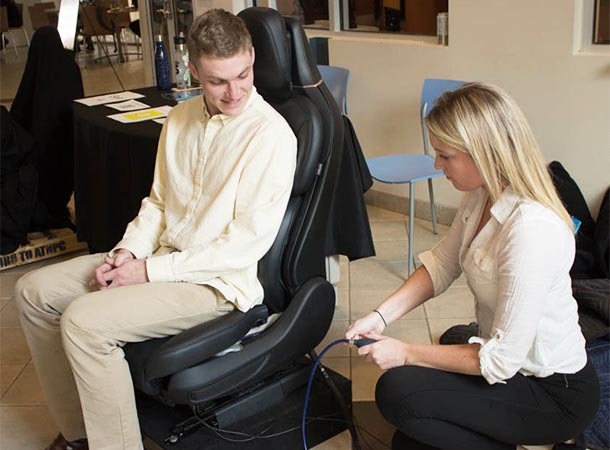 UNIVERSITY PARK, Pa. — A team of engineers worked diligently for months designing a new passenger car seat for the Ford Motor Company, harnessing years of education to create a finished prototype. But they weren’t professionals working in Detroit — the team members were all undergraduate seniors in the Penn State College of Engineering. The students, Sarah Tevis (mechanical engineering), Ryan Shea (materials science and engineering), Rachel Durnin (biomedical engineering), Bradley Buchalter (mechanical engineering), Joe Imbriale (mechanical engineering), and Arnold Bistoquet (mechanical engineering), completed the seat for their capstone project in ME 440, a class that pairs students with real-world clients. Through this hands-on experience, the students said the opportunity to work with the renowned car manufacturer was an incredible one. “I couldn’t believe we got to work with Ford, that’s what I’ve been driving since childhood,” Buchalter said. The team decided to focus on the bolsters that align with the outside of a driver’s legs. “A lot of younger individuals like to be held in the seat more firmly. It feels better if you’re taking corners at elevated speed, instead of feeling like you’re sitting on a couch,” Shea explained. But the team knew that Ford drivers are diverse in their needs, preferences, and body size in ways that affect the comfort of their seat. Through endless brainstorming, they built an adjustable bolster that expands and contracts around a passenger’s legs. “Our design inflates to hug you and can also flatten down so you can get in and out of the car easier,” Shea said. “We worked specifically on the mechanisms under the seat cushion to be able to provide for the adjustments the passenger can now make,” Durnin explained. After a semester of designing, prototyping and building, the team wanted to know how their design stacked up. So they held an event on April 10 at the HUB-Robeson Center that asked other students to rate the comfort of their design against a traditional seat. “Mainly, we wanted to know was how much of an improvement our seat was,” Durnin said. During the event, the team surveyed 56 people and it was reported the testers overwhelmingly preferred the team’s re-engineered bolsters. While they were working on their own design, Davis even arranged for the team to visit a Ford manufacturing plant in Dearborn, Michigan. After observing the plant and how Ford vehicles are manufactured, the team had the opportunity to meet with the engineers who currently design Ford’s seats. “We pitched them our idea for the adjustable bolsters and they gave us a lot of good feedback on it,” Durnin said. The industry partnership was possible through the Bernard M. Gordon Learning Factory, a hands-on facility for Penn State engineering students that emphasizes real-world connections and projects to enhance their education. Since its inception, the Learning Factory has completed more than 2,000 projects for more than 500 different sponsors. “The Learning Factory and capstone design experience provide opportunities for students to learn in a hands-on environment. This is excellent preparation for what they will do as practicing engineers,” said Matt Parkinson, professor of engineering design and mechanical engineering and the director of the Learning Factory. Members of the student design team pose with their industry representative. 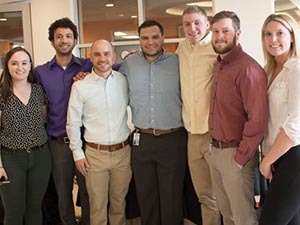 From left to right: Rachel Durnin, Arnold Bistoquet, Ford engineer Patrick Davis, Joe Imbriale, Ryan Shea, Bradley Buchalter, and Sarah Tevis.